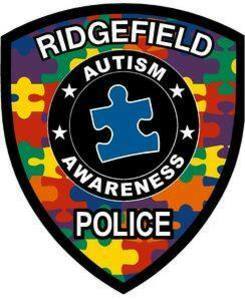 The Ridgefield Police Benevolent Association, with the support of the Ridgefield Police Department, is partnering with Christopher's Voice during the month of April to raise awareness, funding, and support for families affected by Autism Spectrum Disorders. Christopher's Voice is a charitable foundation created by a New Rochelle Police Detective, Christopher Greco and his wife Tracy to help prevent wandering of autistic children, to provide financial assistance and support to struggling families with autistic children and to promote public awareness and safety within the first responder community. The Ridgefield PBA, in addition to a donation to the organization, will be displaying Autism Awareness patches on police vehicles throughout the month of April. This is part of the law enforcement patch challenge, also through Christopher's Voice. The PBA will also receive "go bags" filled with items to facilitate interactions with persons with Autism. This is the PBA's first year partnering with Christopher's Voice, and we look forward to continuing and expanding our partnership in the future.